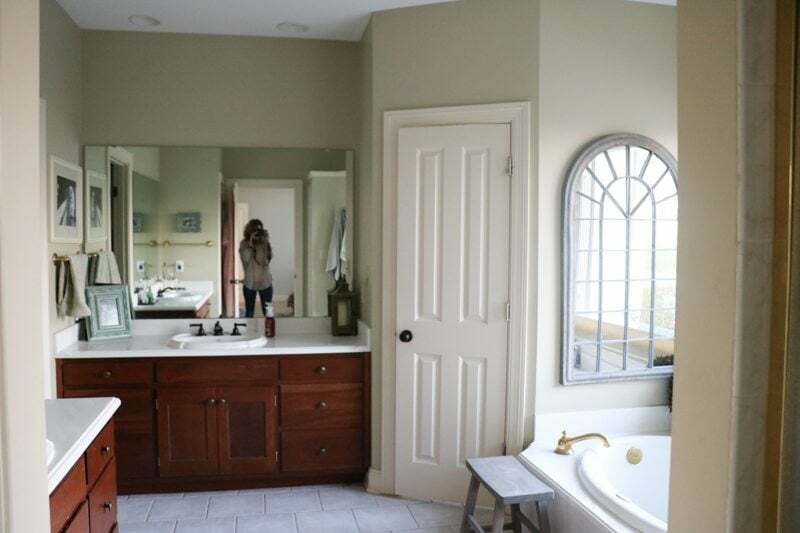 Bathroom Remodel Reveal - Sincerely, Sara D.
The master bathroom remodel is DONE! …but life (roof repairs, pool heater, water heat, air conditioner, furnace and lots of other 20-year-old home problems) kept happening. 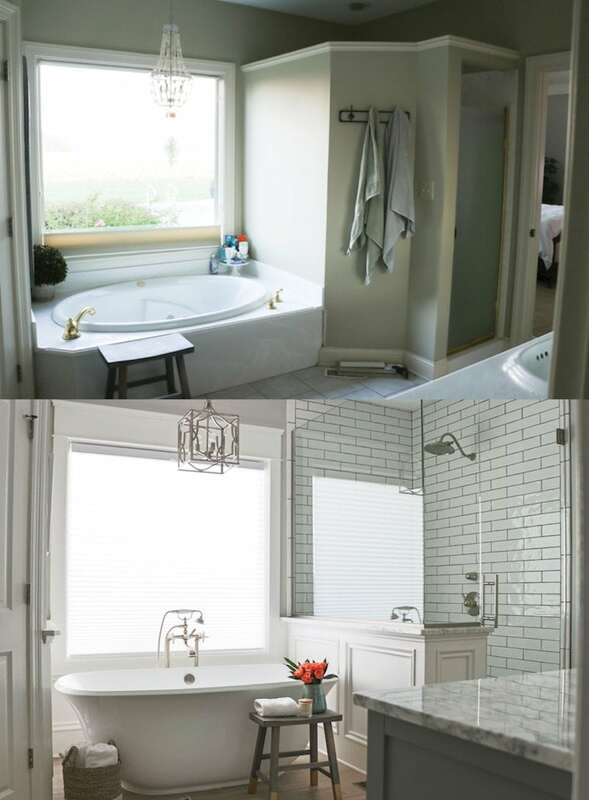 Over the past three years, I have shared several design board ideas for this bathroom remodel as I dreamed and schemed. You can see the details of the design board that inspired this remodel here. This past fall several things fell into place, and we were able to go for it. We hired a contractor and the day after Thanksgiving we demolished the bathroom (you can read more about the demo process here). 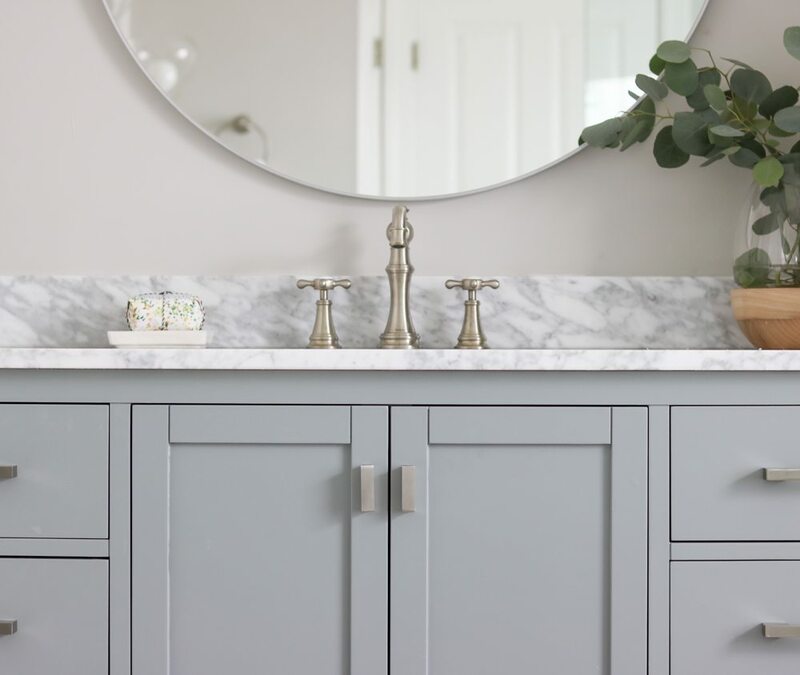 I share the bigger bathroom sources in separate posts (go here to learn all the details about the tile and here for all the faucet details). The majority of the supplies were bought online and shipped straight to my front door (which was so convenient). Since this bathroom was sitting on such a large problem, I knew this was far beyond my scope of DIY. Honestly, it was nice to hand it over to an expert. I still did a lot of the grunt work and painted all the walls, ceilings and trim. 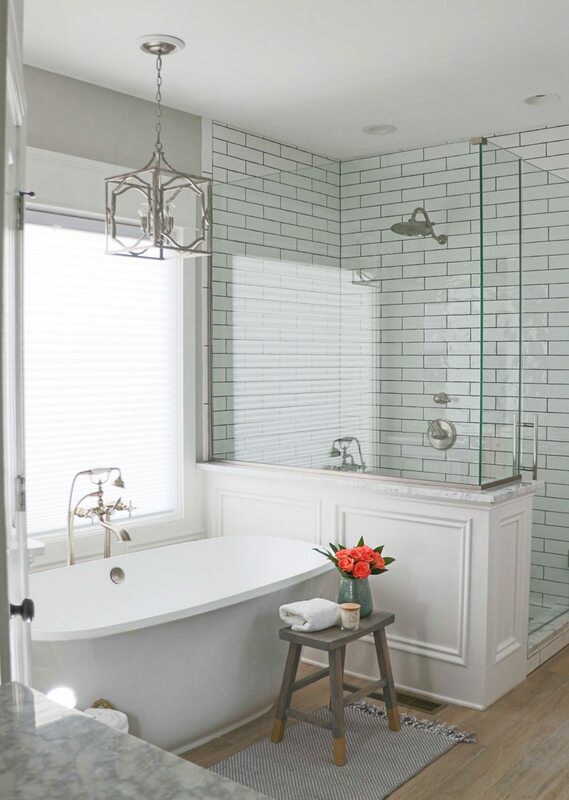 The freestanding tub is from Signature Hardware. I looked everywhere for the perfect shape, and I found it with this tub. The vanities are from Bellacor. 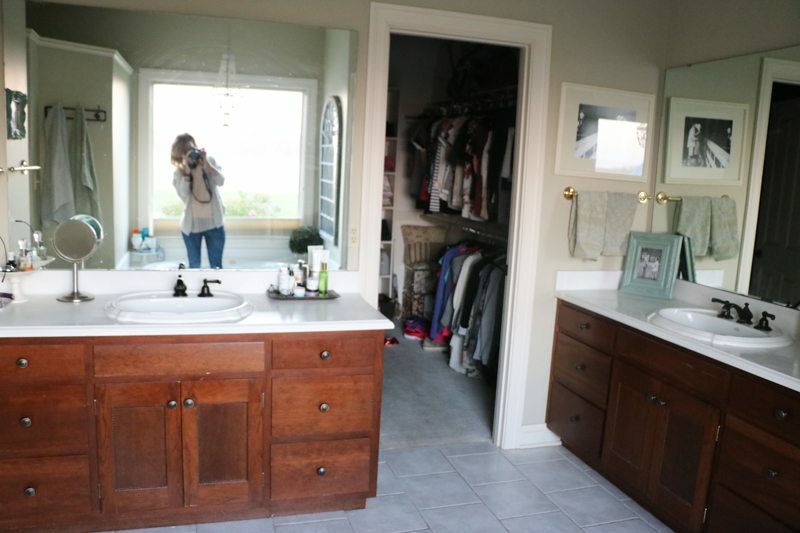 I was nervous buying the vanities online, but they are absolutely perfect. The color is gorgeous, and they are quality pieces. My only complaint is that one arrived with a discolored spot, but I should be receiving paint (from the manufacturer) to fix the problem sometime soon. 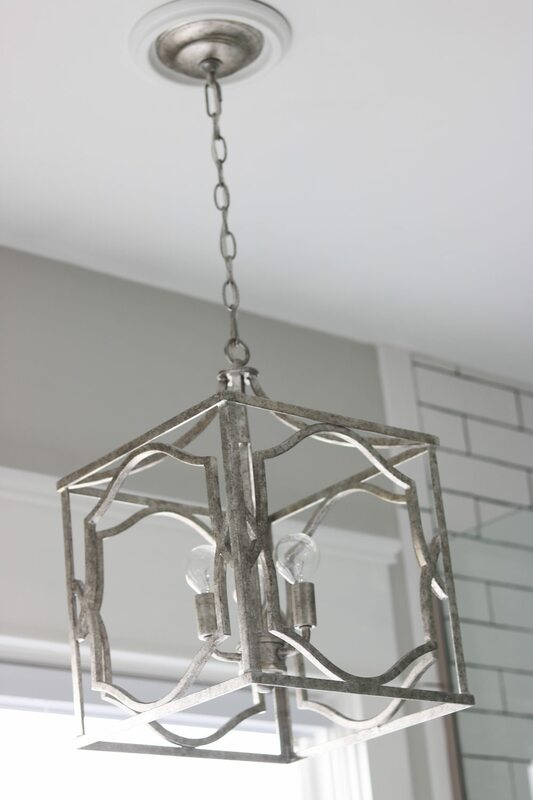 One of the hardest pieces for me to find was the perfect light fixture. 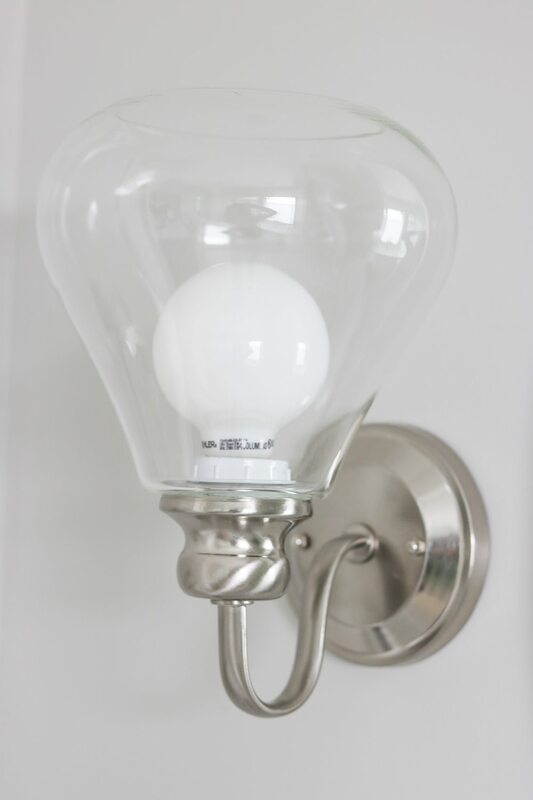 I wanted found this light fixture from Bellacor. The sconces are from Home Depot. I used the Fontane Brushed Nickel Wall Fixture and replaced the shade that came with it with the Clear Glass Open Teardrop Shade. 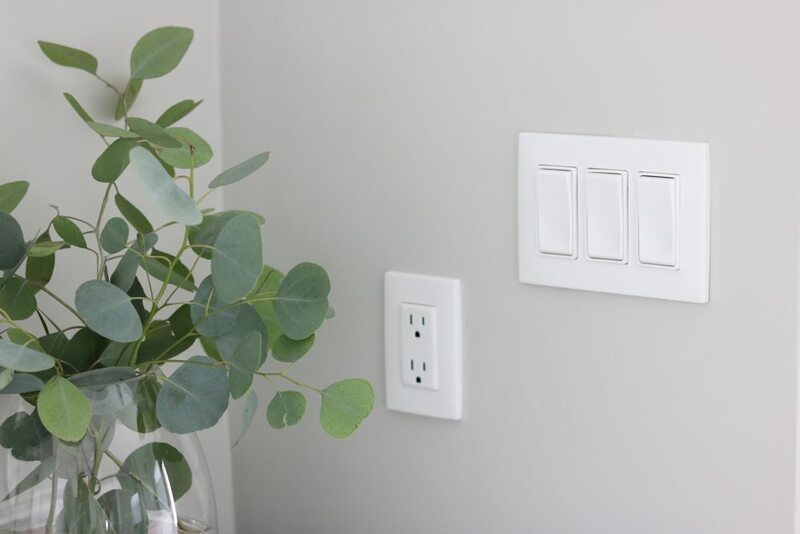 The outlets and light switches are RENU by Leviton. The majority of the decor and accessories are from HomeGoods. 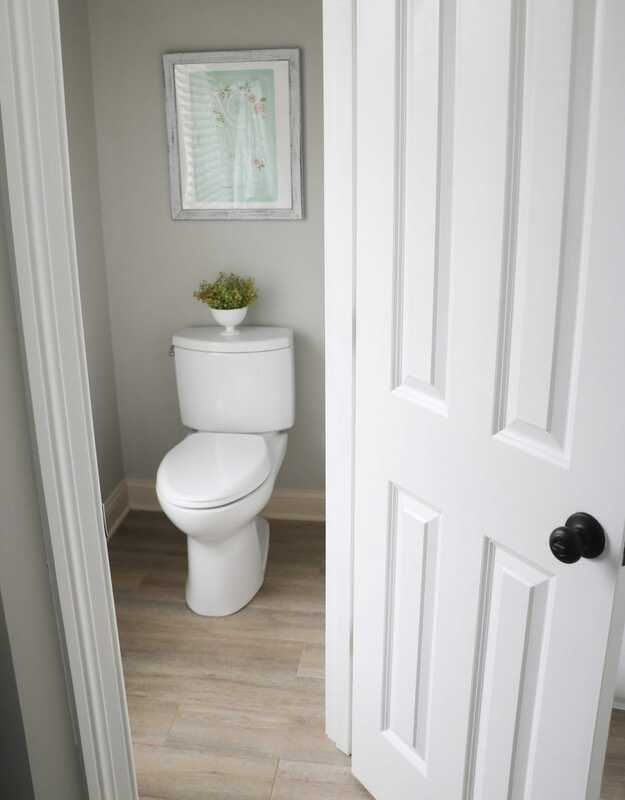 We are so thankful to have a beautiful and functioning bathroom! 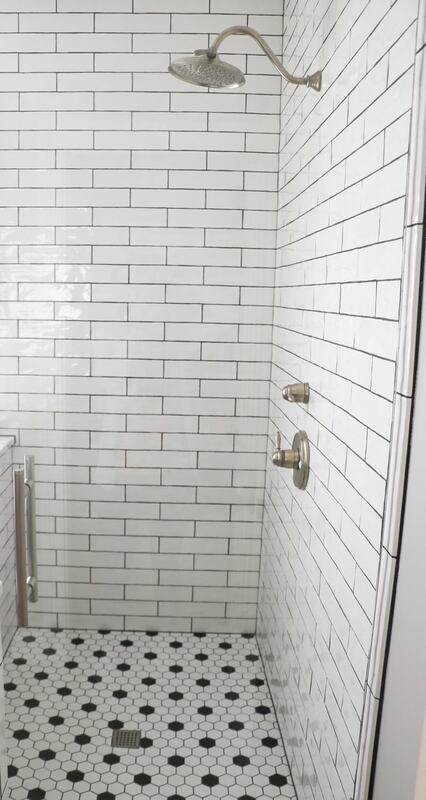 Want to see all the details on the floor and shower tile? Go here to find the sources! 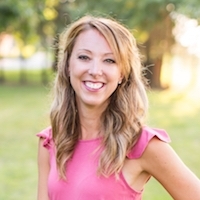 Indianapolis Home Show – I’m Done! Thank you Amy! I appreciate your sweet words and hope you are doing well! Thank you Jennifer! We’re so thankful to have it done! Oops! I forgot to ask- what are the dimensions of your bathroom? I’m building a master suite and am trying to figure out if your layout would work for us. That is an absolutely gorgeous transformation! Love it all, especially the shower and tub. Thank you so much Nickki! I appreciate your kind words and that you took the time to comment – thank you! 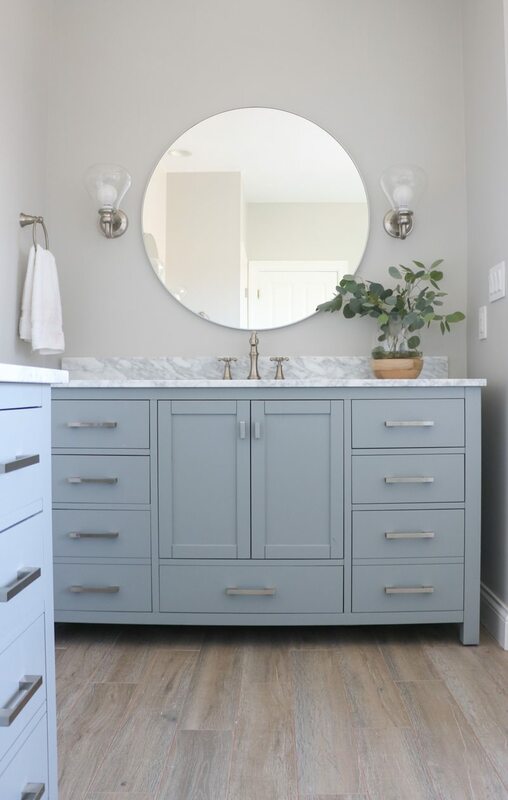 I love the color on the vanities! And the round mirrors and curvy light fixtures to contrast with all the straight lines elsewhere is a great balance. 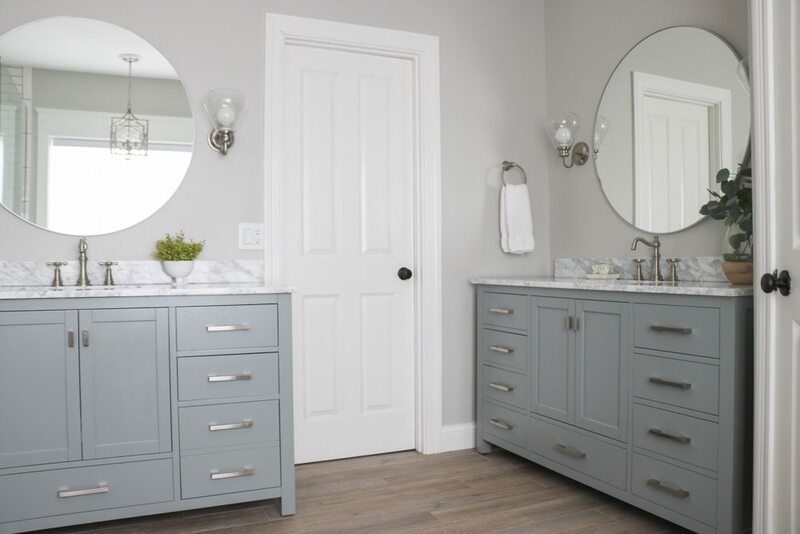 Would love to see the insides of the vanities and your thoughts on the quality of the hardware, fixtures, and marble that came with. That’s always my concern with ordering an “in a box” kind of vanity. Looks fab! Hi Amanda! I just had someone else recently ask me to show the insides of the vanities. I will definitely try to do that sometime soon. 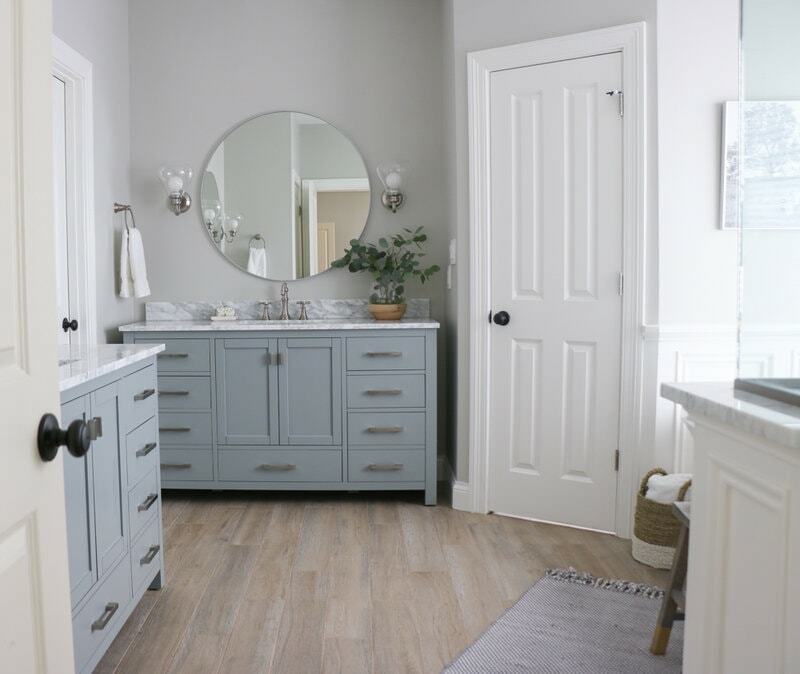 The fixtures did not come with the vanities – they are from Moen. However, the marble (although thin) is gorgeous! I am not in love with the hardware (a little more modern than I would normally go with), but they are quality pieces! I checked out your blog, and I see you also just went with wood tile. I am loving mine so far! 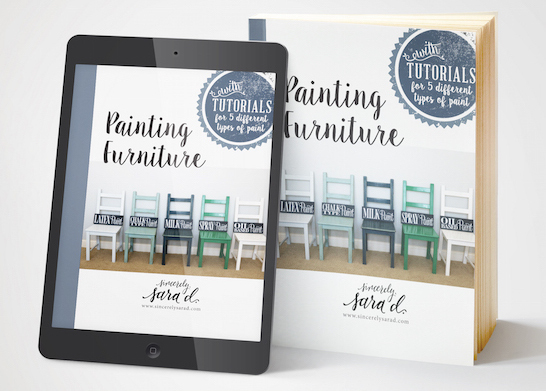 I’m excited to see all your projects (and yes, it is trial & error)! Your bathroom is beautiful! I love the vanity color! Hi, Sara! I’m local to you…Westfield, actually. Would you mind sharing your contractor source? 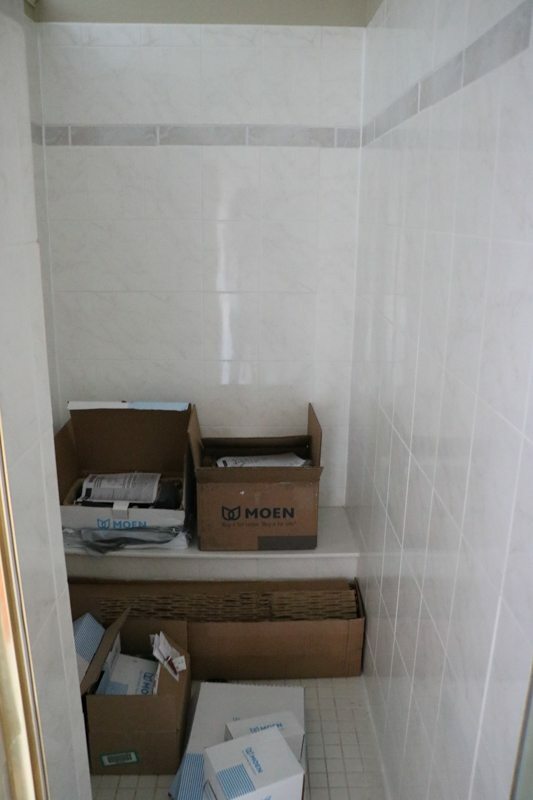 (Privately is fine)I had a tile installer I used for my last 3 homes but he’s since retired and it is extremely hard to find someone willing to do quality work. 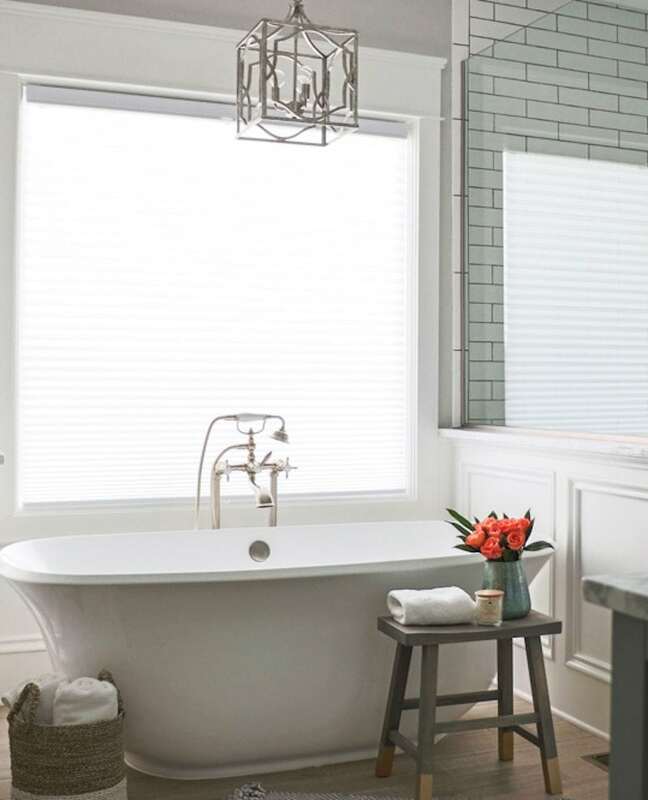 Your bathroom looks amazing so I wanted to reach out to you & ask. Stunning! Love everything about your remodel! Especially the tub and floor tile!! Could you tell me what color paint you chose for the walls. You may have mentioned but I couldn’t find the link. I’m not sure I did mention it! It’s Sherwin Williams Repose Gray! Gorgeous bathroom Sara! 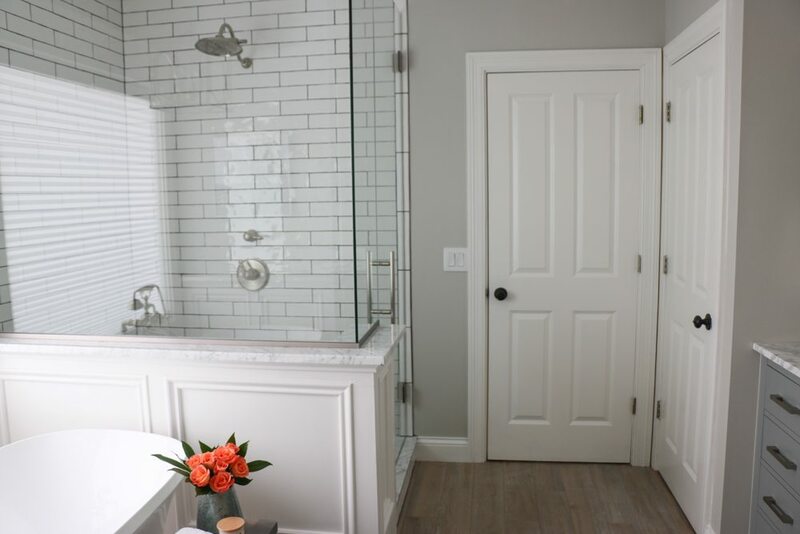 Love, love the wood tile! Thank you for sharing, we are remodeling our master bathroom soon. Thank you Olga! Good luck on your upcoming remodel – I’m excited for you! Love the tub! Did you get the air jets? Foam insulation? We’re seriosuly considering this tub! I LOVE this tub too! I was nervous since we bought online, but it is perfect and SO comfortable. I didn’t get the insulation, but it holds heat well. I didn’t get the jets, but probably would love them (we had to cut costs somewhere). My ONLY complaint is the drain. It’s right in the middle of the tub so it’s easy to unplug. However, it really isn’t a deal breaker. Good luck! Beautiful!!! 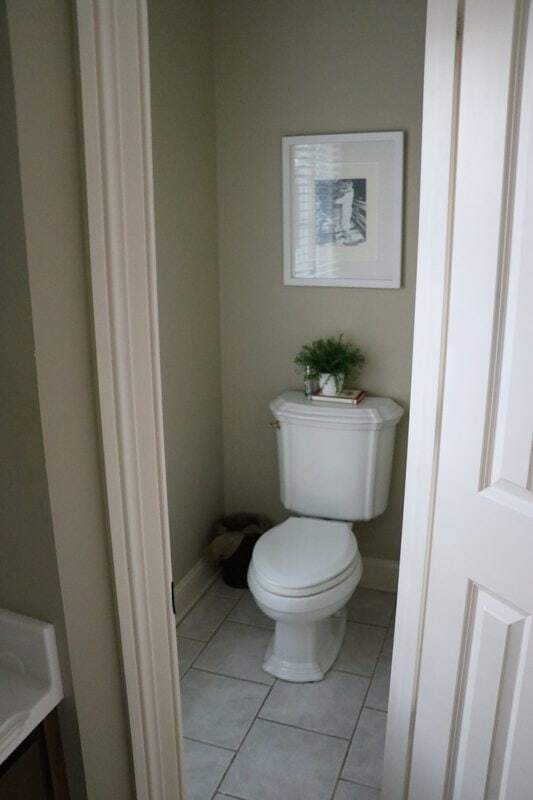 What brand and style is the toilet? I just love how clean and simple it looks. Hi Sara, this is beautiful! Is this the 59″ or the 67″ Lindsey tub? Are you happy with it? Great choices! I LOVE this tub so much that I take a bath in it daily! It’s comfy and my only complaint is the center drain. It’s easily to accidentally open, but it’s not a deal breaker. I went with the 67″ tub – I wanted comfort! Gorgeous bathroom! Can I ask what size your shower is? Thank you Erin! My shower is 58″ x 43″. Love love love! I can not thank you enough for sharing your story. We are in the process of recreating a master bedroom/bathroom & guest room. Your remodel is beautiful! 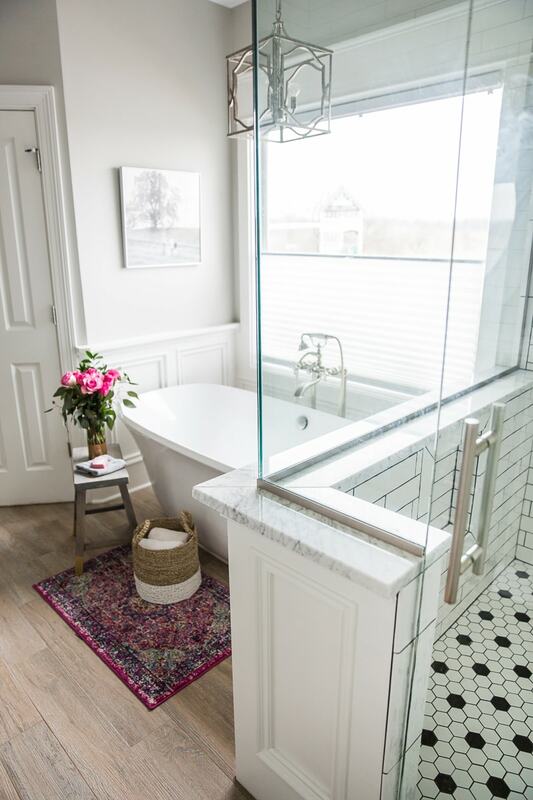 I’m praying we can find some great pieces & was wondering about signature hardware, I recently stumbled upon their website… love the tub you chose, can I ask…. what’s the maker/style name/number? Hi Hope! I’m excited for your remodel adventures! 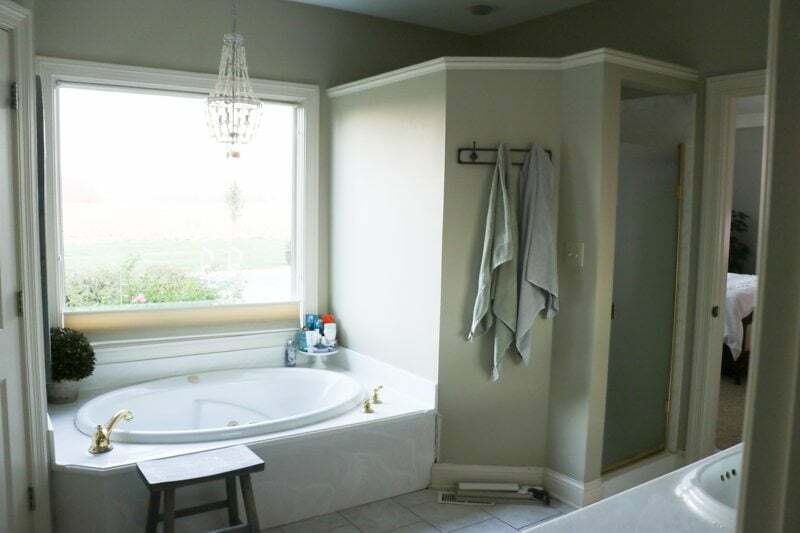 Here’s a link to the tub: http://www.signaturehardware.com/bathroom/bathtubs/acrylic-tubs/lindsey-acrylic-freestanding-tub.html Good luck!! Ours doesn’t have air massage, but I do love it! The tub itself is incredibly comfortable and well insulted! Found your remodel on pinterest! Stunning! 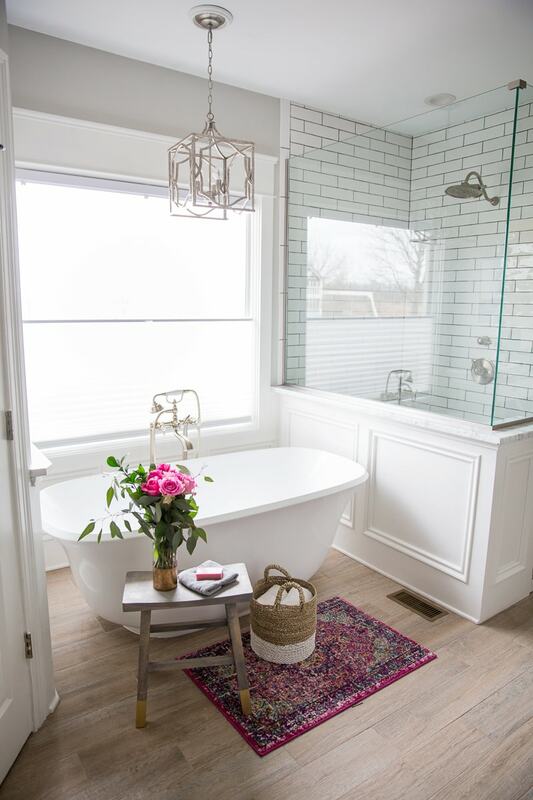 I’ve been looking for the perfect light above my free standing tub and found just what I was looking for when I saw your remodel. What size light did you get? I see there are two-12 inches wide or the larger, 18 inches wide. Thanks so much! Love your remodel to death!!!! What taste and style! Is your chandelier the 12 inch or the 18 inch? Been looking for a long time and saw your pinterest phone and knew I had finally found it! Many thanks! Hi Toby – thank you! I went with the 12 inch chandelier! Sara … love the look of your new bathroom. We, too are working on plans for ours. I am having difficulty with the size of tub. 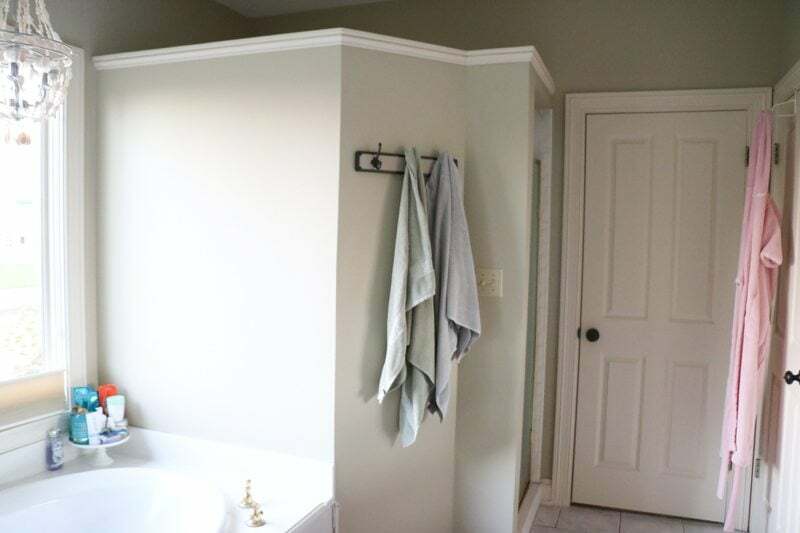 How do you decide how much space to leave between the top of the tub (which is the biggest area 66″) and the surrounding walls. Is there any rule of thumb…. 5 to 7″maybe? Also I am doing the wainscoting around the 3 sides of the tub and i want some of that to be seen and not totally hidden by the tub.. Thank you for your thoughts. Hi Jacqueline, I wanted the biggest tub possible, and we really only had around 6 inches extra. The wainscoting made that space even smaller. 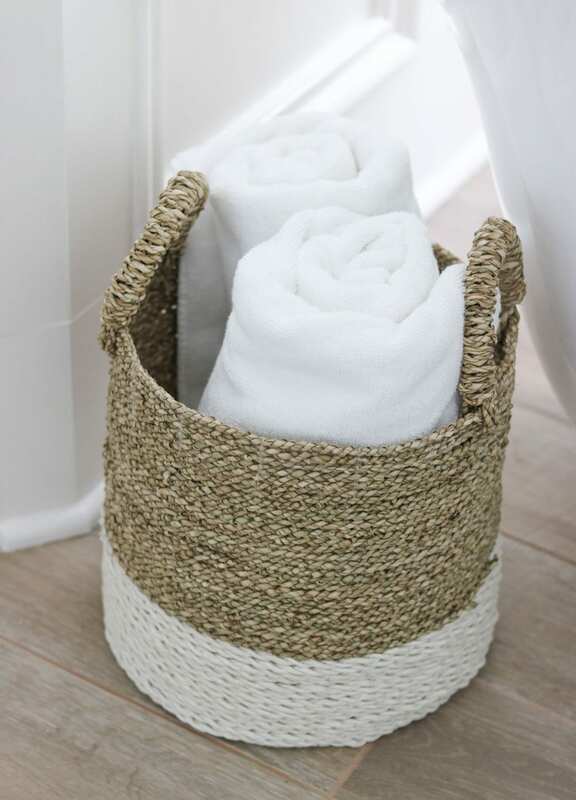 It has worked great – except it is hard to clean around the tub with it in such a tight space. I hope this helps! This is so gorgeous! Very well done. Thanks Sara! We love the space. Is the navy woven rug also from a home Goods? Do you know the brand? It was, but it didn’t last long. I’ve since replaced it – I’m sorry I’m no help! What color is your shower grout? Hi Sara, Your remodel is beautiful. 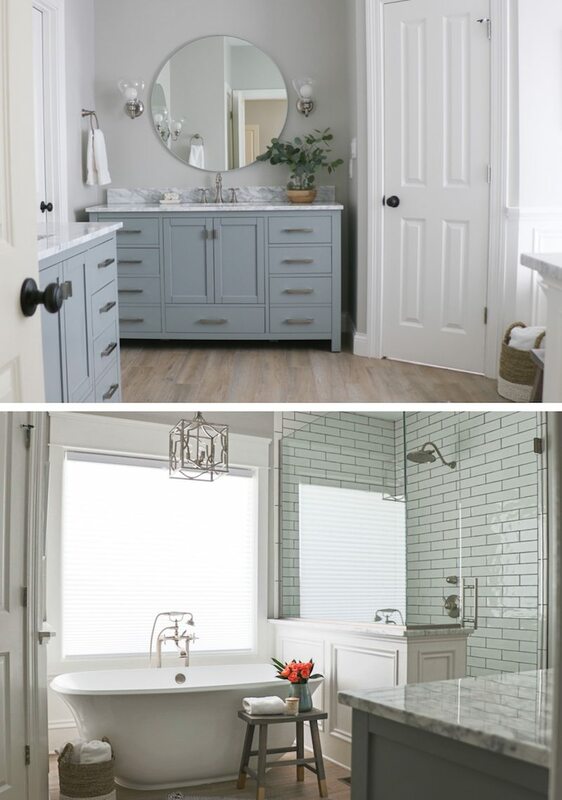 Can you please tell me the grout color used for the wood tiles? Thank you. We used Power Grout in Light Chocolate. I love your wood look tile floor. I actually ordered samples online to see it in person. I’m wondering if it’s difficult to clean or if dirt gets trapped in the ridges since the tiles have so much texture. I love the color of it but want something easy to clean. Hi Donna, I was worried about the grooves, but I’ve no issues with them! 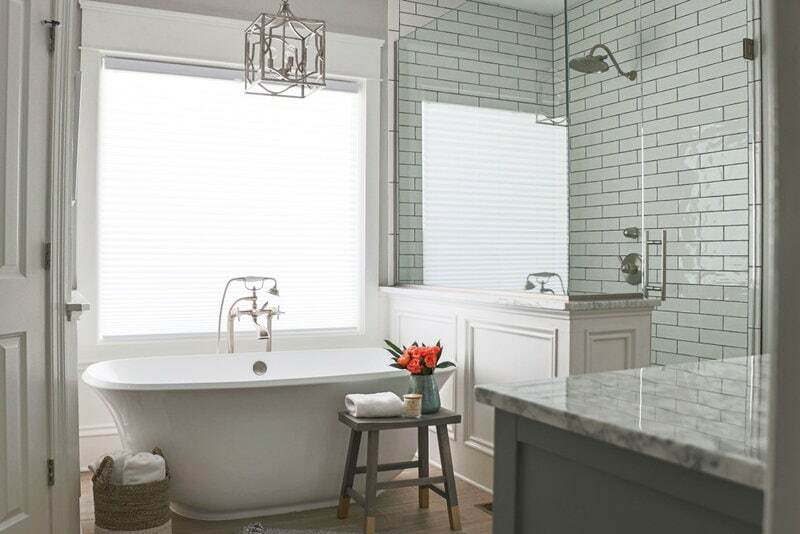 I LOVE this tile – it’s one of my favorites! You did not talk about then main things , like how you found the space. The arrangement you chose. Need more basic info. Not just decor. Hi Elaine – I didn’t talk about the arrangement because I left it the exact same as it was before. The arrangement worked for us, and it was less expensive to not move things around.